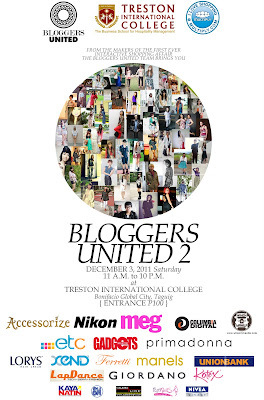 Manila’s finest fashion bloggers will leave their laptops at home once again to attend BLOGGERS UNITED BAZAAR (Part 2) on December 3, 2011 at Treston International College, Taguig, this coming holiday season. It is the second installment of the first-ever Bloggers United: An Interactive Shopping Affair, which was held last May. Due to insistent demand from readers and bloggers alike, Bloggers United (http://www.facebook.com/bloggersunitedph) team in partnership with the country’s largest online shopping website, Multiply Philippines (http://multiply.com/) have gathered Manila’s fashion bloggers to sell their pre-loved but very stylish closet pieces! This event is the perfect opportunity for both bloggers and their adoring readers to mingle and personally interact with each other. Fun contests and exciting giveaways from sponsors and entertaining performances from bloggers (Walkie Talkies, Reese & Vica) themselves will definitely keep this event from being a dull one. Some of the notable bloggers attending the event include Divine Lee, Laureen Uy, Kookie Buhain, Lissa Kahayaon, David Guison, Karl Leuterio, Patricia Prieto and Preview Magazine’s own Daryl and Andre Chang. But because Bloggers United wishes to go beyond the geographic limitations of the archipelago and extend its reach beyond Metro Manila and so for this event, they are flying in some of Cebu’s very own fashion bloggers which include Kryz Uy, Eden Villarba, designer Yves Camingue, Gillian Uang and Mildred Zapanta and a few more. Part of the proceeds from this event will go to the GMA Kapuso Foundation (http://www.kapusofoundation.com/) for its school building project, a small but significant step to improve the Filipino youth’s access to education. The organizers behind BLOGGERS UNITED BAZAAR (PART 2) are Ana Gonzales (http://anagonzales.com), Melai Entuna (http://styleandsoul.blogspot.com) and Aisa Ipac (http://ipaxme.blogspot.com), a team of blogger friends encouraging camaraderie and sense of “community” among Manila’s (and eventually, the country’s) fashion blogging community through events and productions like this. This is a one-day-only event that you shouldn’t really miss! It will be in a bigger venue with twice more the number of participating bloggers to meet! This is the perfect shopping day this Christmas because the most affordable and most fashionable clothes, accessories and footwear will be up for grabs. See you!